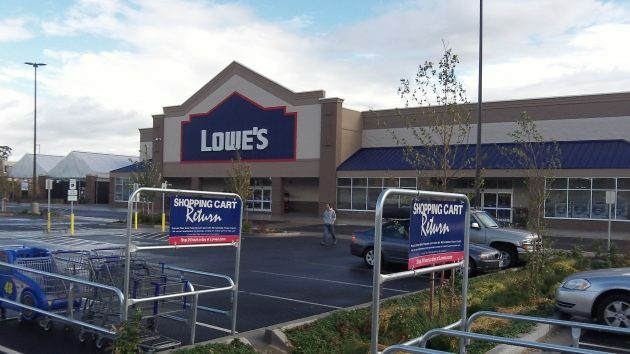 Lowe’s new Albany home improvement center is on the tax rolls for the first time this year. If you’re interested in property taxes — and who isn’t? — you may want to dive into the tables and reports that Linn and Benton county tax officials have prepared for 2016, ahead of sending out the annual bills. I sampled the material, and here’s what caught my eye. For one thing, if Linn County is any example, property taxes have resumed the gradual but steady climb they showed during the decade that ended in 2009. For the three years of the great recession, 2009-11, the totals went up hardly at all, but then they started growing again in 2013. I couldn’t find a similar online summary or graph for Benton County, whose annual tax reports and tables are numerous but a little harder harder to decipher. Linn County taxing districts, including the county, cities, school districts and all the rest, together imposed $152 million in property taxes this year. That’s an increase of 4.1 percent from last year’s total of $146 million. As it happens, the total taxable value in Linn County also went up by 4.1 percent to nearly $9.4 billion. Linn’s exemplary summary also tells you the market values, taxable values, tax rates and tax amounts imposed for every jurisdiction in the county, all on two easy-to-read pages. So you quickly learn, for example, that $187 million of Albany’s $3.6 billion in market value (on the Linn County side) is set aside for urban renewal. In terms of tax revenue, that amounts to about $2.3 million that’s channeled to the Central Albany Revitalization Area. Lebanon’s urban renewal value is greater than Albany’s, at $224 million. And urban renewal taxes in Linn’s second city total $3.8 million. 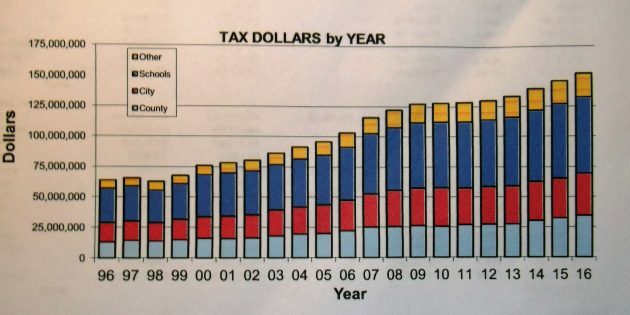 Benton County’s overall total of property taxes imposed this year is $132 million, up about 5 percent from last year. Taxable property value reached almost $8 billion, up 5.2 percent from about $7.6 billion last year. Just like in Linn, the growth in total tax and taxable value are more or less aligned, which is what you would expect as long as tax rates are constant and fixed. One more tidbit from the 2016 tax reports. In Linn County, the median real market value of all residential improved properties as of Jan. 1, when these values are established, was said to be $164,780, up from $151,000 last year. In Benton County, the median value was $256,150, up from $240,810 in 2015. Stop using any and everything that our tax dollars provide. Then, you won’t feel “imposed” upon. So your objection is that my nom de plume is not what you prefer? The comments from the anti-taxers (similar to the reactionary anti-vaxers) while perfectly nonsensical, is the bread and butter of this production. Anyone who dare challenge the Shadle/Cordier/Kellum/Hering paradigm is subjected to ridicule. Kellum’s sophomoric response to Hering’s having chastised me is typical and tells us a lot about why Albany continues to languish. Oh well! Thanks for the post and the counter on the comment, Hasso. It made this hour of my morning. They really need to change the system so that the taxes you pay are proportional to how much your property is worth, not some hocus pocus formula that takes a house back to it’s 1995 value. I pay more in taxes than my neighbor whose house is almost twice as big as mine. I have a spreadsheet with my property tax increase going back to 1997 when I purchased my house. The average, cumulative increase, is over 3% a year. This is cumulative, so it adds up. During the imaginary real estate boom in the 2000’s, my appraised was less than the taxable portion, but in the meltdown after that, the two met again. As taxation is public information, I would be interested in seeing the taxes for your house and your neighbor’s house. But the reason I disagree is based on the following. 1) When purchasing a house, or planning for retirement, one needs to be able to project what the taxes will be in the future. While I think the 3% increase is too high, at least it does allows one to predict what my property tax bill will be in 20 years, which one would be unable to do without that limitation. 2) Property tax, unlike sales or income tax, is totally un-connected from one’s ability to pay. If a family becomes unemployed this impacts the ability to pay, which both the sales and income tax take into account, but not the property tax. The same thing happens as one retires. For many displaced workers, who find they they are out of a job in their 50’s say, and have to take a much lower paying job (due to age discriminiation) just to survive, the property tax again doesn’t care. So, I believe a tax that is dis-connected from ability to pay is immoral, and I oppose it on those grounds. 3) What one’s property is worth is beyond the control of the owner. During the unrealistic boom in the 2000’s houses were inflated in value unrealistically due to a real estate bubble. The appraisals reflect this, and while unsustainable and imaginary, folks had not choice but to pay the taxes. The state is happy with this increased income. The problem is that once a house is on the tax rolls you can’t challenge it’s value in 1995. It is entirely unfair. Portland is an even greater example of the failings of Measure 47/50. You have neighborhoods in North Portland that are rapidly gentrifying, houses are worth half a million or more but taxed at half their value. Meanwhile my house is worth 200k and taxed at 200k. I guess I knew what I was getting into and I am sure any system will have some level of unfairness but to act like measure 50 was some well thought out plan is rather disingenuous. I mean look at the clown that wrote the measure, the guy is a total tax cheat. 47 was written by Sizemore and 50 was only to clarify what 47 intended, just to clarify that. I understand people want what is best for themselves. Part of why we are in this mess we are today. People don’t care for what is most fair or best for society as a whole anymore. I am still confused. My properties taxable value does increase every year. It is not frozen at a 1995 (or ’97 in my case) value. It has risen so much that the ‘appraised’ value and the ‘taxable’ value actually met in value during the post-2008 meltdown. Forgive me if those words are not entirely accurate, I do not have my tax bill in front of me at the moment, but I hope you know what I refer to. The 3% increase (compounded) raises what I am taxed on each and every year. Yes, the property tax reports on the county’s website are revealing. For example, look at the Summary of Assessments & Levies for tax year 2015-2016, Table 4e. It shows where CARA siphons its money from. For example, $960k was taken from the city’s general fund; $688k taken from the school fund; $224k taken from the GAPS bond; $35k from the Vet’s Home; and $13k taken from 4-H. I always thought property tax revenue must only be used for the specific purposes voters approved. City voters never approved CARA. Thankfully, a city measure passed several years ago will right this wrong on new urban renewal plans. I don’t ordinarily post here – primarily because I’m not a big fan of the local reactionary crowd, which includes Mr. Herring. However, with all due respect…. I’m a little taken by the sanctimony of those ridiculing those who use pseudonyms. I suppose what primarily motivated me was the highly respectful term “chicken” hurled at one of the other posters. According to legend, Mr. Herring’s label for ’em was “weasels” when he was editor of the local paper. Lot’s of class there, I must say. We all a very aware that social pressure is a powerful force in most any community – usually used with a vengeance by those skilled at it. For myself, I usually pay more attention to what is said rather than who is saying it. It sort of helps avoid the because-I-say-so authoritarians of our world. I can remember from history classes that the pseudonym “Publius” was used by Alexander Hamilton, James Madison, and John Jay in the Federalist Papers. I wonder if Mr. Herring considers those three men to be “weasels” too. This is an old thread I know, but thought I’d put it out there, now that the tax bills are in. My house taxes have gone up 6.32% from last year (the 3% mandatory + bonds). Last year my house taxes wen up 8.62% from the year prior to that. My property taxes these two years, went from $3,464 to $4,001. Doing the math as taxes are cumulative 4001 – 3464 = 537. 537 / 3464 = 0.155. My pay has not increased accordingly. My assessed Value (property and structure) rose 10.68% this year, following an increase of 12.18% the year before. My Taxable value, of course, rose 3.0 % each of those years.